We are a couple in our mid 60&apos;s and we had a wonderful time on the Fun Ship Paradise Our Cabin Steward Ketut was awesome during our B2B cruises. We had him for both cabins & his friendly greeting calling us by name was a pleasant surprise. We chose late cabin service, but the ice for the day was always there when we got back from breakfast. The cabin U198 was smaller than anticipated for a balcony, no night tables or chairs and the 2 overhead bunks still worked out OK for the 2 of us. The Aft balcony U226 was great. The Dining Room staff in the Destiny were terrific. Ronnie our waiter called everyone by name, remembered who had coffee the night before, has a smile that is genuinely a pleasure to see. The Food is subjective. I thought it was OK. The salad bar, the pizza & the Ceasar salads from the Pizza Bar were all excellent. Guys Burger bar is Guys. You like it or you don&apos;t. The deli sandwiches were good. The chocolate buffet was just that! Lots of chocolate.The Elation dining room seaday brunch Eggs Benny were fine. The Enterainment was beyond our expectations. The 70&apos;s show, the 80&apos;s show, Fat Tuesday fun, 80&apos;s rock triva on the Lido. The CD&apos;s Leon & Melessia added so much to the experience. The PG comdedy show was so so. The R rated not very funny in my opinion, and I love comedy shows. 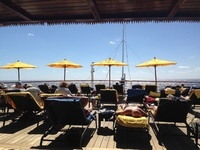 A lounger could always be found in the sun or the shade.The Serenity deck was pleasant and even on the last part of the cruise with the Full ship (spring break started & lots of families) we never felt over crowded. The Waterworks was a good place to watch the kids having a blast & there were lots of loungers there as well. We also tried the mini golf which was a very good course. Our Cabin Steward Ketut was awesome during our B2B cruises. We had him for both cabins & his friendly greeting calling us by name was a pleasant surprise. We chose late cabin service, but the ice for the day was always there when we got back from breakfast. The cabin U198 was smaller than anticipated for a balcony, no night tables or chairs and the 2 overhead bunks still worked out OK for the 2 of us. The Aft balcony U226 was great. The Dining Room staff in the Destiny were terrific. Ronnie our waiter called everyone by name, remembered who had coffee the night before, has a smile that is genuinely a pleasure to see. The Food is subjective. I thought it was OK. The salad bar, the pizza & the Ceasar salads from the Pizza Bar were all excellent. Guys Burger bar is Guys. You like it or you don&apos;t. The deli sandwiches were good. The chocolate buffet was just that! Lots of chocolate.The Elation dining room seaday brunch Eggs Benny were fine. The Enterainment was beyond our expectations. The 70&apos;s show, the 80&apos;s show, Fat Tuesday fun, 80&apos;s rock triva on the Lido. The CD&apos;s Leon & Melessia added so much to the experience. The PG comdedy show was so so. The R rated not very funny in my opinion, and I love comedy shows. 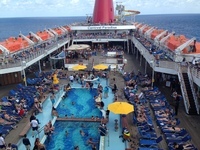 A lounger could always be found in the sun or the shade.The Serenity deck was pleasant and even on the last part of the cruise with the Full ship (spring break started & lots of families) we never felt over crowded. The Waterworks was a good place to watch the kids having a blast & there were lots of loungers there as well. We also tried the mini golf which was a very good course. If you don&apos;t want to go far, the Port Area is a great place to shop, eat & drink. There are even a few loungers in the the sand there!. We went into San Miguel via taxi for $10. Walked the town square and Malecon for a while. Then a taxi to Money Bar for the best Nachos EVER & some snorkeling. We booked an outside company Cubaoutings, for a 9am to 3pm walking & old car driving tour of Havana. 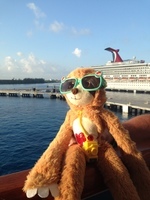 Then after returing to the ship for dinner & a nap went back out to walk the area & stop at places for drinks & music. Felt totally safe & had the most enjoyable time in this port. Cultural, Historic & Entertaining. Just as a FYI, Monday the Museums are closed. The first Monday of the month the Flea Market is closed.